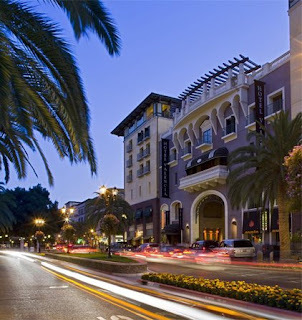 We decided to spend fairly locally to Cupertino today so we went to the Valley Fair Mall in Santa Clara, which is just across from Santana Row, a wonderful boulevard of shops, hotels, residences and restaurants. We discovered them the last time we visited and were eager to return. The 21st Century Husband is at work, so we are looking forward to seeing him this evening. We did have breakfast all together this morning in the hotel restaurant, Park Place. The waiter recognized us from yesterday and the service was wonderful. I love it when restaurant staff take the time to remember you. He even remembered exactly what we ordered yesterday, although we disappointed him by just having the continental breakfast today. We promised to come back tomorrow for something from the à la carte menu. The breakfasts at the Park Place is really lovely, but we find we eat so much when we are in California, some days we just have to have a lighter breakfast (not to mention that we do have vouchers for the continental breakfast and we really ought to use some of them)! After my husband headed off to work, my son and I set off on our shopping expedition. We had a very successful day. I even got a pair of my favourite Calvin Klein Jeans from Macy’s for $38. They would have cost me over £100 at home. The Valley Fair Mall is lovely and has shops like Macy’s, Nordstrum’s and lots of speciality shops including an Apple Store. We also had a wonderful lunch at The Cheesecake Factory in the Mall. We love The Cheesecake Factory. Their food is just wonderful. I had a chicken and cashew nut salad that was really yummy. I love salads in North America; people are so creative with them. This one had an Oriental citrus dressing with a gorgeous flavour. As you would expect, cheesecake at The Cheesecake Factory is also delicious too, although we do find that we have to share a piece between the two of us because it is just so rich. Today we tried their White Chocolate Caramel Macadamia Nut Cheesecake. How could it not taste good with a name like that? We’ve worked our way through a lot of their flavours over the years (it’s hard; they keep making new ones!) but we are pretty sure this is the best one we have had so far. We wandered over to Santana Row afterwards. It really is a great neighbourhood, with some wonderful shops and restaurants. It’s very cosmopolitan and really reminds me of Europe. It would be a great place to live, except there isn’t very much parking! My son has to study for his exams, so we made sure we were back at the hotel by 3 pm. When we went out to the car, it was absolutely baking hot. I could not even touch the steering wheel at first. This is our first hot sunny day in Cupertino and we are really enjoying it. Tonight we are having dinner at Benihana, a Japanese restaurant, with some of my husband’s work colleagues. They cook the food right in front of you on huge hot plates. It’s very entertaining watching them as most of the cooks are real actors, and joke around a lot. The food is delicious too. The time is still going by way too fast, but I’m definitely having fun!